NH Rep. Renny Cushing|! !| D-Hampton|! !| is filing legislation to reactivate a repealed law that prohibited burying radioactive nuclear waste in the state. Rep. Renny Cushing was writing 2016 legislation that would charge Seabrook Station $500,000 annually to store high-level radioactive waste onsite when the longtime anti-nuclear activist stumbled across a stunning discovery. The law that was passed 30 years ago prohibiting an underground radioactive waste dump in New Hampshire had been quietly repealed as part of the 2011 state budget bill. It was repealed so quietly that it never made the news, unlike the thousands of headlines generated by the 1986 protests that prompted its passage. “I found out about it almost by accident,” said Cushing, a Hampton Democrat. Cushing co-founded the anti-nuclear group Clamshell Alliance in 1976 to fight the construction of the nuclear power plant in Seabrook. “There were town meeting votes taken all over the state in 1986 that were opposed to the siting of a high-level radioactive waste dump here,” Cushing said. “The Legislature got up in arms and decided to be proactive about it” and passed New Hampshire’s High-Level Radioactive Waste Act – the one repealed in 2011, Cushing said. Cushing quickly rewrote his proposed 2016 legislation, which would charge a fee for storing nuclear waste onsite, so it will now include reactivating the 1986 law banning burial of radioactive nuclear waste. Cushing had asked the Office of Legislative Services to borrow some definitions from the original language from 1986 after he was notified it had been repealed. When the U.S. Department of Energy listed New Hampshire in 1985 as one of a dozen eastern states under consideration for an underground nuclear waste repository, the protests were loud and many. The DOE was exploring New Hampshire’s granite, especially in Hillsborough and the surrounding area, for a second repository. Yucca Mountain in Nevada was to be the first such repository and is still the DOE choice, but the project was never funded. Barbara and Philip Daley didn’t know in 1986 whether they would be able to stay in Hillsborough to raise their four young children. It looked at times as if their home could be taken by eminent domain so the government could build an underground civilian nuclear waste dump in the granite their home was built on. The U.S. Department of Energy was looking at New Hampshire and 11 other eastern states at the time for possible locations for a repository to bury high-level radioactive nuclear waste. “It was a very stressful time for everybody,” Barbara Daley remembers. But townspeople and folks across the state joined together with People of New Hampshire Against the Nuclear Dump and other groups to fight the government. They protested. They worried. They testified at public hearings. Often, Daley perched her youngest son, Joshua, on her hip as she spoke out against the dump. Journalist and author Joyce Maynard lived in Hillsborough at the time and memorialized the angst in a New York Times Magazine article, “The Story of a Town” published May 11, 1986. Thirty years later, with 10 grandchildren and their hearts well-settled in Hillsborough, Daley and her husband are happy they were able to stay. Some neighbors from those days have moved away, Daley said. Others have passed away. Now, neighbors rarely talk about the nuclear dump except when newcomers want to hear the tale. Daley remembers townspeople taking to their pickup trucks during one protest. A convoy of about 50 or so trucks filled with families and anti-nuclear dump signs traveled 20 miles northeast to Concord. They wanted state lawmakers to know they wouldn’t stand for a nuclear dump in their town. Daley believes their voices were heard in 1986, when people across the state voted on a non-binding warrant article at 100 town meetings to oppose burial and transportation of nuclear waste in New Hampshire. Lawmakers followed suit that year and passed the law prohibiting a nuclear waste dump in New Hampshire. Daley was surprised to learn that law was quietly repealed in 2011, but pleased Rep. Renny Cushing, D-Hampton, was filing legislation to put it back on the books during the 2016 session. “After all these years of using nuclear power, we still don’t have a solution for the waste,” Daley said. Times were different then, she said, less polarized politically. Republicans and Democrats, liberals and conservatives joined the fight, with a few exceptions. “There were some people, mostly older people who would say things like, ‘If this is what the government thinks we ought to do, then that’s what we ought to do.’ It was a different mindset of a generation who didn’t grow up in the ‘60s,” Daley said. Daley, who is 65 now, taught piano lessons over the years. She still does. She also volunteers at Smith Memorial UCC and accompanies the chorus at Hillsboro-Deering schools. Her husband Philip, 70, is retired from a career in computers. He volunteers now, updating a statewide website for a recovery group and oversees the computers at the Fuller Public Library where he is the chairman of the board of trustees. Hillsborough has been that kind of home for the whole family, she said. “I love it when you walk down the street and everybody says hello in passing,” Daley said. Cushing and other anti-nuclear activists are concerned because there has been no permanent solution nationally on how to dispose of the radioactive waste generated at nuclear power plants. President Obama’s policy has been to select sites only if there is local and state consent. New Hampshire may be one president and one act of Congress away from the whole siting process being reopened, according to Paul Gunter of Beyond Nuclear. 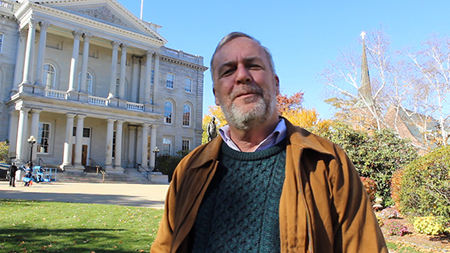 Gunter, another co-founder of the Clamshell Alliance, said in a telephone interview he is aware that New Hampshire has rolled back prohibition of siting a spent fuel disposal dump. “It has certainly raised some concern with us,” Gunter said. The DOE and Congress have essentially opened up the search for a high-level radioactive waste deep repository through a blue ribbon commission, he said. Gunter said the nuclear industry has resorted to economic shortcuts that don’t qualify as a permanent resolution for the nuclear waste problem. Nuclear power plants such as Seabrook are now storing their spent fuel rods and other waste onsite, he said. “There is this effort under way to accommodate the industry conundrum of nuclear waste being generated without a long-term management plan,” Gunter said. That was never originally contemplated when plants like Seabrook were licensed to operate, he said. “It does concern us that the politicians in New Hampshire are obviously looking out for industry interests instead of public safety,” he said. Several New Hampshire lawmakers said they either don’t recall how the 1986 law was repealed in 2011 or insist it was part of a broader budget item that was proposed at the beginning of the process. It first shows up in 2011 as a simple line in then-Gov. John Lynch’s proposed budget. Republican Peter Bragdon, who was formerly Senate president, said there was nothing secretive about the repeal. “The repeal was a part of the budget introduced into the House on day one, so it was not some item that was slipped in when nobody was looking. It was there from the beginning,” said Bragdon. Bragdon said the repeal appears to have been part of a revision of the duties of the state Office of Energy and Planning. “What is not clear to me right now is whether this revision of duties was requested by Governor Lynch or the OEP or was, in fact, an initiative in the House,” Bragdon said. Bragdon said the state’s Nuclear Waste Policy Advisory Committee set up by the original RSA 125-G was eliminated in 2009-2010. Seabrook spokesman Alan Griffith said he didn’t know anything about the legislation and could only answer questions about plant operations. “All nuclear agencies do safely store their waste at the site,” Griffith said. The repeal also went unnoticed by another anti-nuclear activist in the Legislature, state Rep. Barbara French, D-Henniker. She was a school nurse in 1986 and protested because she was worried about raising her family down the road from a dump in neighboring Hillsborough. 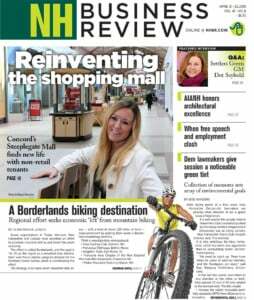 French is concerned that without the law in place, New Hampshire could again become the target of a renewed national repository search. Thirty years later, there is still no permanent solution on how to dispose of spent fuel, she said. When Cushing told her about the repeal, she responded by asking how she could help. French agreed to co-sponsor Cushing’s legislation that would reactivate the law and charge a fee for onsite nuclear waste storage. Figuring out what to do with the nuclear waste is critical, she said. Cushing said the waste mostly consists of spent fuel rods and anything else that comes into contact with it. Nuclear waste is dangerous for many thousands of years, he said. “The lethality of spent nuclear fuel, I can’t get my mind around a hundred years let alone 250,000 years,” Cushing said. InDepthNh.org is a New Hampshire-based nonprofit investigative news website. Nancy West can be reached at nancywestnews@gmail.com.